The Great Dumpling Debate: What Makes The Cut? : The Salt The humble dumpling seems unencumbered by controversy until you start trying to define it. We asked three experts to weigh in. Tell us what you think, too. Which of these are dumplings? When we first started thinking about dumplings for NPR's Dumpling Week, we presumed that there wasn't much to the little balls of dough. They seemed simple, universally beloved and unencumbered by controversy. But the semantics of the dumpling turns out to be far more fraught that we imagined. 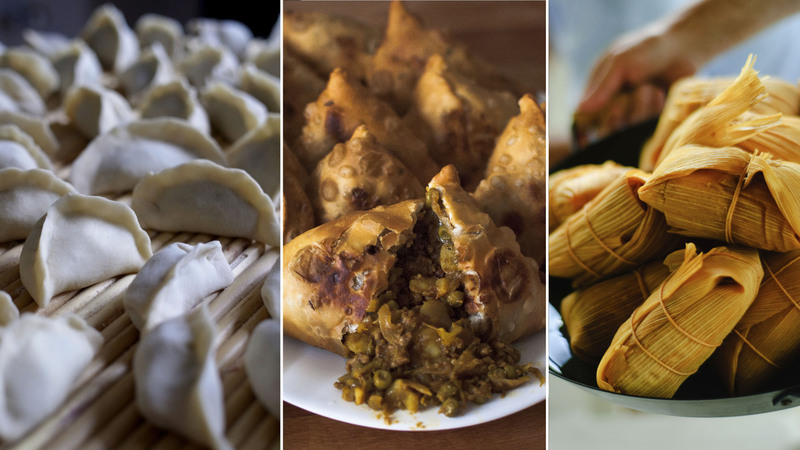 This became clear when we started wondering whether tamales, or samosas, counted as dumplings. The deeper we waded into the pool of quasi-dumpling snacks, the more we realized we needed some expert input to set us straight. We put together this small panel to help rule on what can rightfully be called a dumpling. Fuchsia Dunlop, a Chinese food expert and author, most recently, of Every Grain of Rice: "My definition of a dumpling is any kind of dainty little snack that's made of one ingredient wrapped around another ingredient, and usually boiled or steamed, but sometimes fried." Ken Albala, a professor of history at the College of the Pacific: "The best way to probably define it is to say something that goes 'dump!' into the water. Something that's boiled and keeps its shape." Frederick Douglass Opie, professor of history and foodways at Babson College and author of Hog and Hominy: Soul Food from Africa to America. "A dumpling is a mass of dough about the size of a U.S. fifty cent coin or larger. Cornmeal dumplings are solid and used to soak up the flavor of whatever they are cooked in — most often soups and broths. Flour dumplings are generally larger and filled with vegetables, fruit, dairy or meat. Dumplings most likely originated in the kitchens of peasants (subsistence farmers) and proletarians (wage workers) as a savvy, cost-saving filler." According to Dunlop and Opie, samosas and tamales can lay claim to the dumpling name. What do you think? How would you define a dumpling?